Target shooting has developed a reputation as one of the safest of all sports because everyone in it must learn and follow basic safety rules. Target shooting is a sport of control and discipline where everyone involved, including participants, instructors, coaches and range officers, is expected to know and apply the sport’s safety rules at all times. We have air rifle instructors certified from the National Rifle Association of India and who are members of the Pune District Rifle Association; we also have retired Indian Army and Navy officers who volunteer their support during our outdoor sporting events. We ensure optimum supervision and safety during your course. All training and competition related material is provided; all you have to bring is some focus, a student mentality, and sportsmanship. We train you with sporting techniques to aim and shoot at targets and/or props only. We practice wildlife conservation and strictly abstain from willfully hurting any animal, bird or plant in the vicinity. This message will be elaborated as a part of the do’s and don’ts during rifle shooting. Shooters acquire the large discipline patch at the onset of the program and as each rating is earned, they are entitled to all of the corresponding awards. Each rating level has a skill rocker, medal, and certificate award that recognizes and highlights the achievement. 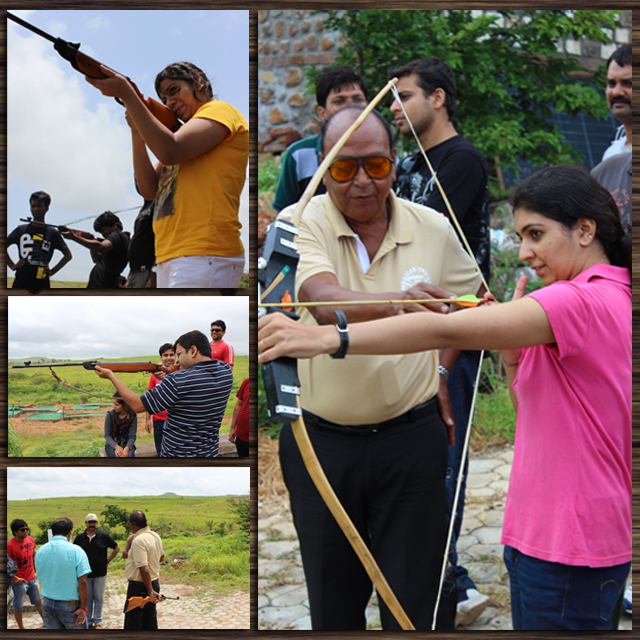 Besides shooting from rifles we use traditional methods of target shooting such as archery, tomahawk and slingshots.